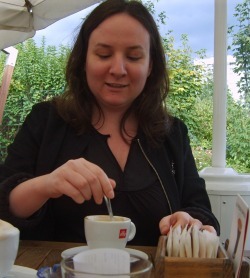 Sheena Scott is undertaking a PhD in the French Department at UCL on French cinema, entitled "Tactile Moves: an Archaeology of the Sense of Touch through French Cinema." She received a Distinction in her MA in Film Studies at UCL where she wrote a dissertation entitled "The (In)visibility of Cinema: The concepts of 'voir' and 'se représenter' in Jean-Luc Godard's latest films from 1996 to 2004." She also has a BA from UCL with a first in French.